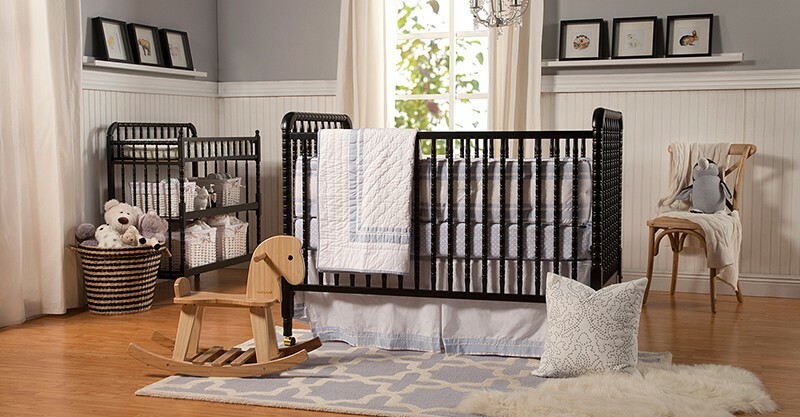 A beautiful cot won’t make your baby sleep through the night, but it sure will make your nursery pretty. During those early days of parenthood when a new mum walks around in a sleep deprived haze with spit-up running down the back of her shirt, any small victory is accepted gratefully. DaVinci Baby’s Jenny Lind cots are definitely a coup for parents in terms of style and price. With their pretty spindle slats and glossy finish in pristine white, cherry or black, these cots inspire a Downtown Abbey-esque old fashioned charm. Unlike what the British aristocracy might pay for furniture, Jenny Lind is practically available for a song: US$200. As a generation facing a world where space often comes at a premium, we love children’s furniture with longevity. The Jenny Lind cot has four mattress levels to save your aching back and keep bub safely contained. When baby’s a toddler and no enclosure can hold them, the side comes off and the cot becomes a toddler bed. And when the days of the big kid bed arrive and your child’s finally – fingers crossed – sleeping well, you can claim this pretty piece of furniture as a day bed for all the book reading, tea drinking and napping you’ve got to catch up on. Jenny Lind cots are only available at bricks and mortar stores in North America, so you will need a reshipper and, of course, we’ll keep you posted on Australian stockists.